When traveling to someplace new, finding that perfect location that combines a lot of fun things to do with a fascinating history to explore, will ensure you have a memorable experience. 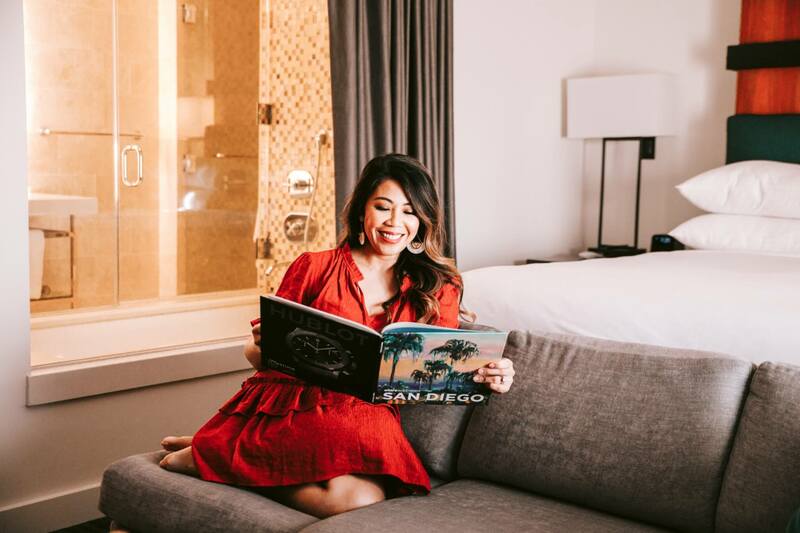 For those looking for that special place, the Andaz San Diego is the perfect place to go! 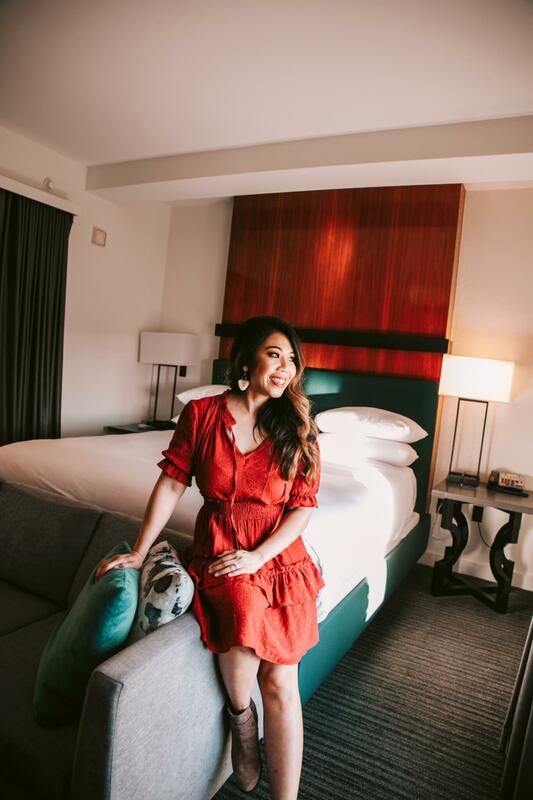 This is a sponsored post with Andaz San Diego where I received a complimentary stay. I do not earn commission from any bookings or affiliate sales. As always, my reviews remain honest, and all opinions are my own. San Diego has the sun, the beaches, and that great year-round weather. We recently had the opportunity to spend a weekend in the city to take in the sights and see my husband’s alma mater, Northwestern, play in the Holiday Bowl. With so many great places to stay in the area, how do you narrow it down to one? Having never spent any real time downtown, we decided to stay in the Gaslamp Quarter, or as the locals refer to it, the Gaslamp District. This sixteen-block area is the historic heart of the city. Its origins trace back to 1867 when Alonzo Horton purchased land in hopes of creating a new city center. It houses hundreds of restaurants, pubs, nightclubs, and retail shops which are walkable throughout the district. There is even a 53,000 square foot Horton Plaza Park which was built on land that Alonzo Horton sold to the city back in 1895. It’s a great area to stay if you are visiting San Diego. With that decision made, having enjoyed staying at the Andaz in Napa, (see review here) it was an easy decision to try the Andaz San Diego for this weekend trip. 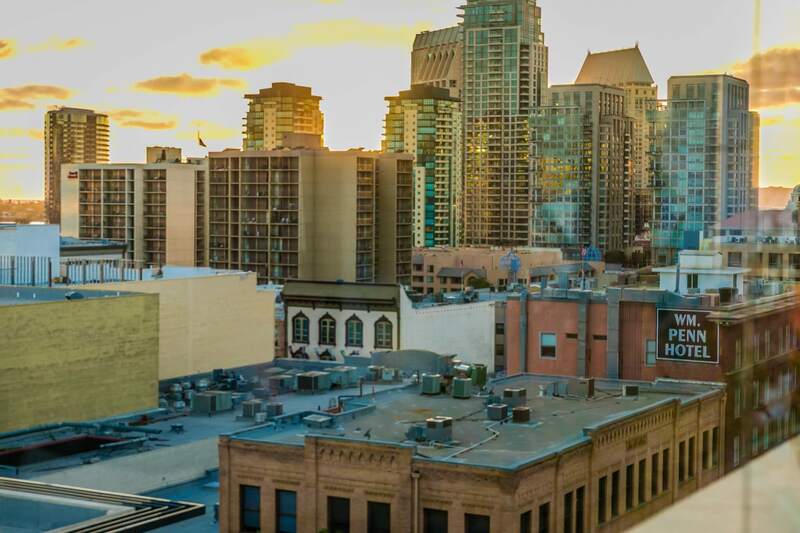 As you drive into the Gaslamp District, you can tell this will be a fun spot to stay. The streets are busy with people walking about to the various shops, restaurants, art galleries, and nightclubs. While not crazy like New York’s Times Square, you can feel the energy from people out enjoying themselves. 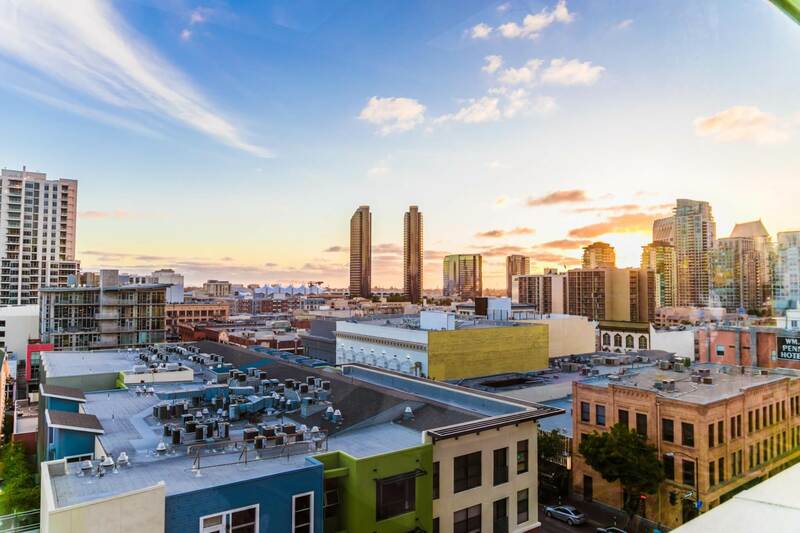 A few blocks off the busiest streets was the Andaz San Diego hotel – conveniently located near places you want to eat and shop, but not in the middle of the most lively sections. The lobby design is contemporary and classy. Despite its upscale design, it has a welcoming vibe due to the warm, inviting colors and low lighting. 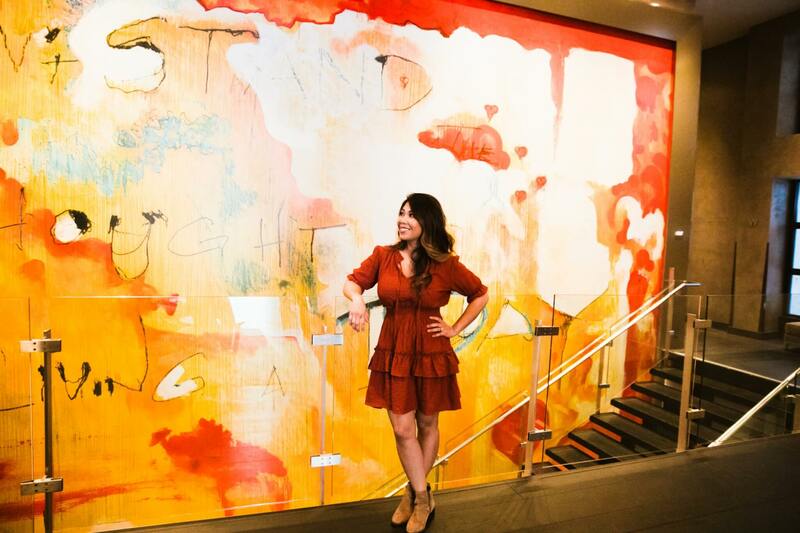 Toward the back of the lobby, you’ll find a colorful, contemporary two-story mural (totally Instagram worthy). 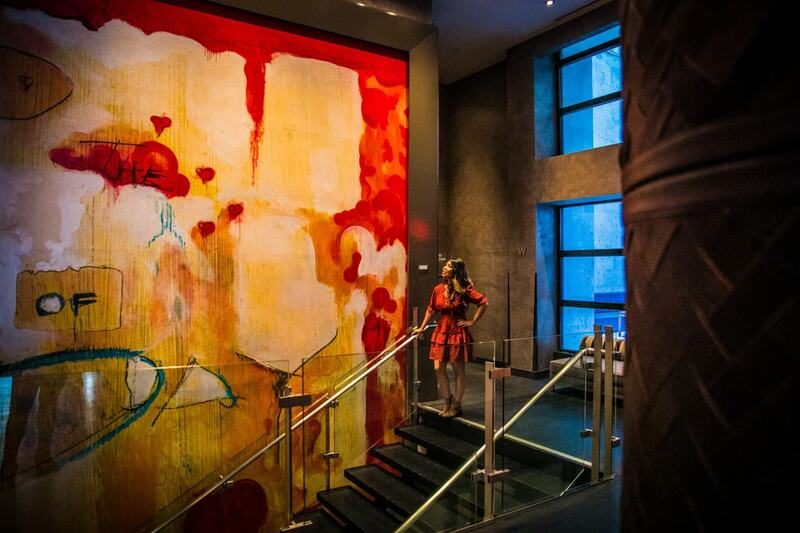 For art lovers, be sure to look around, as you’ll see various artwork displayed throughout the hotel. 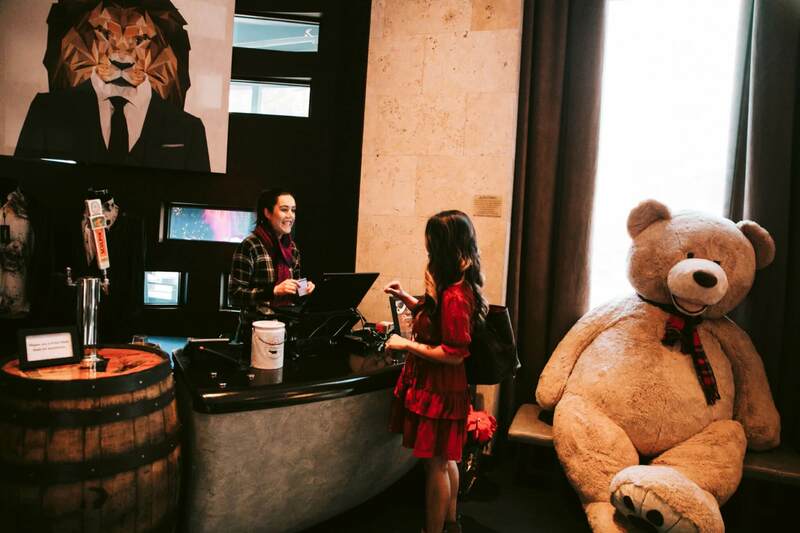 Like the Napa property, you check in at an open reception area which has a friendly feel to it than a traditional check-in counter. 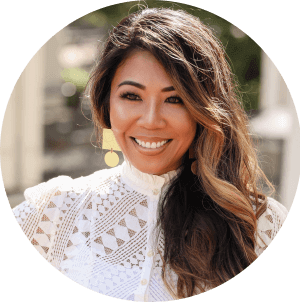 The staff was incredibly helpful and professional, with a quick check-in process. Similar to Napa, they gave us a glass of wine – always a great way to start vacation! We stayed in a King Deluxe room which was a nice size at 400 square feet. In front of the kingsize bed was a small sitting area complete with a sleeper sofa that you could use to watch TV – a better way to watch rather than sitting up in bed. 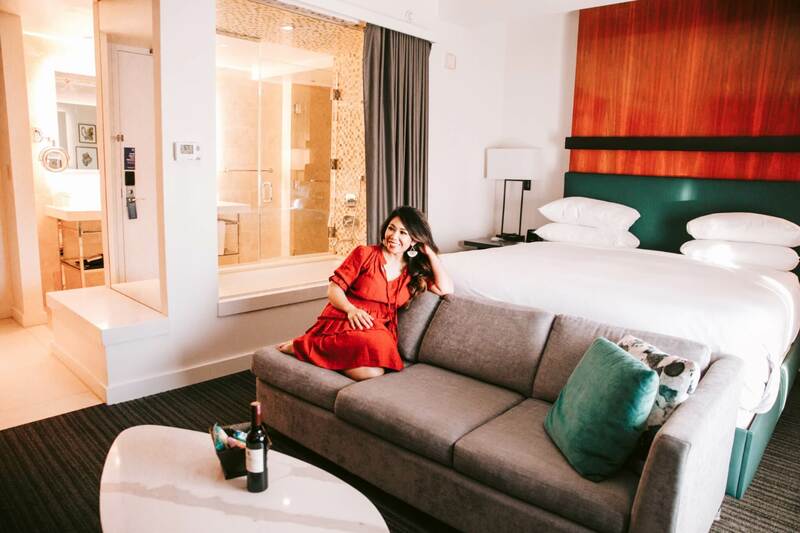 The room came with sleek, modern furnishings and a large window to enjoy the city views. Room amenities include free Wi-Fi, 46” flat-screen TV, minibar with select complimentary snacks and beverages, and a Keurig coffeemaker. Unique to the room was the large glass-enclosed shower and tub combo which separates the bedroom from the bathroom area. This glass wall really opened the space and made it feel much larger than the typical 400 square foot room. We have seen a lot of hotels, but this was a different feature that was a nice compliment to the room. For those not wanting to shower in a “fishbowl”, there is a floor-to-ceiling curtain you could close off for privacy. After having checked in and unpacked, we headed up to The Rooftop by STK. 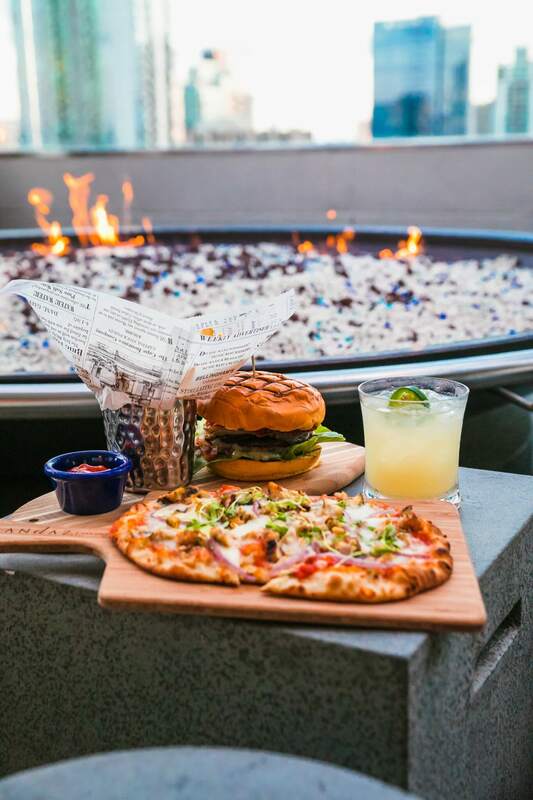 The Andaz San Diego takes advantage of the fantastic weather with a vast open rooftop space. This is not your typical rooftop, as it has everything! 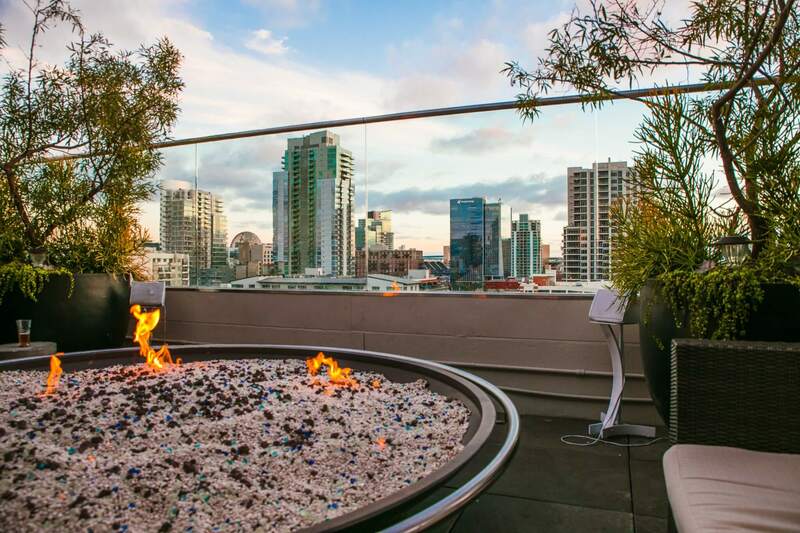 As you exit the elevator and head to the rooftop, the first thing you see is a remarkable firepit framed by the expansive views of downtown San Diego skyline. 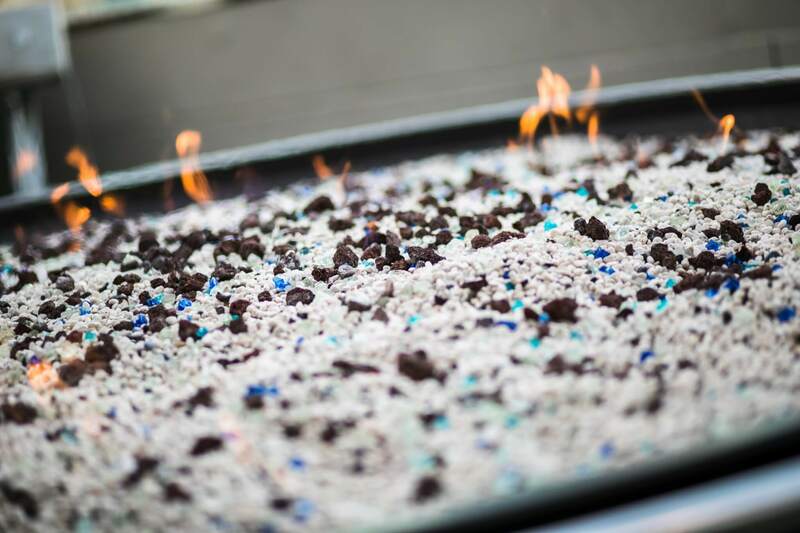 To call it a fire pit is a misnomer, as it is so much larger than you would expect! Closer to the size of a hot tub, this circular pit was filled with dancing fire to warm you up on a cool California night. Surrounded by sofas and chairs, it was a great spot to enjoy appetizers, drinks, or even a full meal. 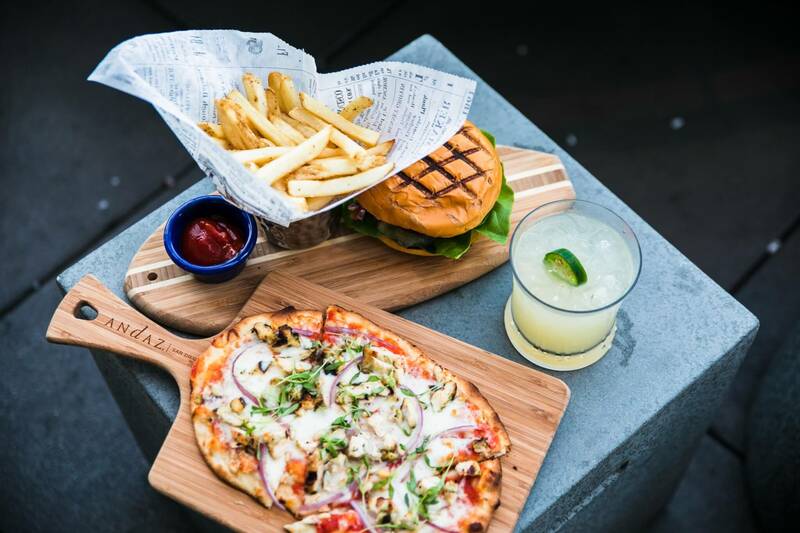 We suggest the Cauliflower bites, Hall Pass flatbread, and South of the Boarder Burger. For drinks, try the Hollapena Atcha Boy (spicy margarita) and the Hot Mess (prosecco with berries). From that center point of the rooftop, in one direction there were many open seating spaces and cabanas to lounge around and enjoy some outdoor time. The restaurant was across the seating areas which was a great place to have breakfast with impeccable service. We recommend the Chilaquiles Verde and the Breakfast Burrito. It’s a great way to start your morning – delicious breakfast with a view! Proceeding to the other side of the rooftop were more seating areas, including a hip outdoor bar. The beautifully constructed L-shaped bar had plenty of space to sit and enjoy a drink. At night the bar had great lighting and had flat-screen TVs to catch up on the day’s events. Walking pass the bar, step up to the rooftop pool at the end of the area. Grab a chair and relax under the sun where you can either enjoy those non-stop views or soak up the rays of that warm, California sun! On this floor, you will also find a gym, which also takes advantage of the rooftop location using a glass wall to see out while you exercise. It has a nice mix of equipment offering plenty of options to get a workout in while you are at the hotel. At the end of that hall, you will find a men’s and women’s area to change, shower, or use the restroom. It has the feel of a country club locker room which was a nice touch. STK San Diego is “the modern steakhouse with a chic lounge”. Their specialty is steak but also serve other entrees such as fish. A couple of favorites on the menu are the parmesan truffle fries and tuna tartare. Visit the USS Midway Museum located at the Navy Pier. It’s a great experience for the whole family to see an interesting exhibition of American history! If you’re into fine arts, there are plenty of galleries to visit! You can find a list here. If you want a delicious dinner with great ambiance, head over to Cucina Urbana. Order a house-made pasta entree and choose from their excellent wine list and pair the dish with your favorite red or white! Or you may eat at Werewolf instead for more casual fare like their Grilled Garlic Ginger Wings and Bourbon bacon burger. Speaking of wine, Vin de Syrah is a hidden gem. It’s an underground wine bar that is a favorite among locals. It’s a great place to hang out and relax with coworkers or friends. We saw a couple of lively music venues while walking around. A dueling piano bar, The Shot! House, was pretty packed (always a good sign). 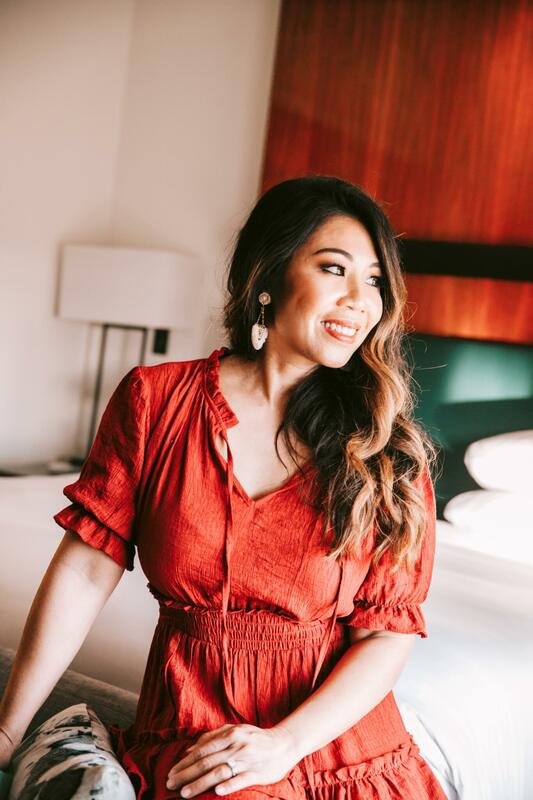 Listen to these talented singers belt out your favorite pop song or sing along to a crowd favorite (…if I have to hear “Sweet Caroline” one…more…time…UGH!). Prohibition is another speakeasy bar to visit. If good drinks and live music are your thing, you’ll have a blast at this 20’s themed bar. 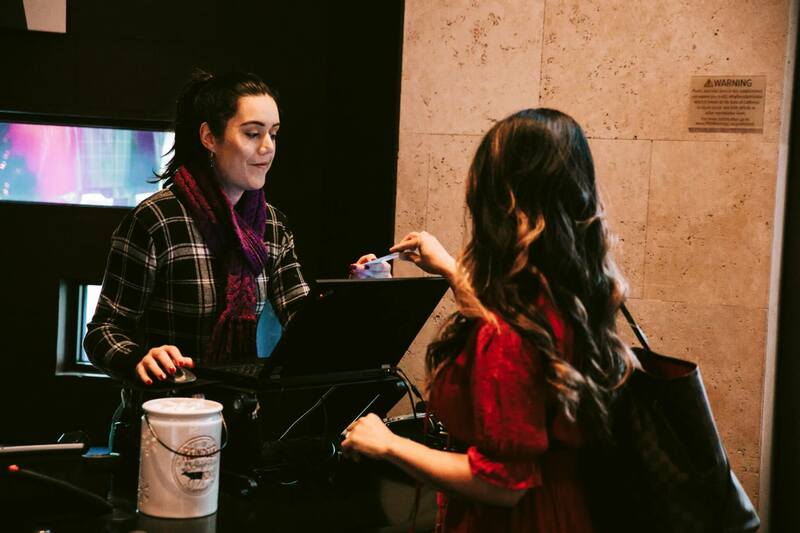 This chicly elegant hotel is in a prime location in the historic Gaslamp District downtown with shops and restaurants all within walking distance! 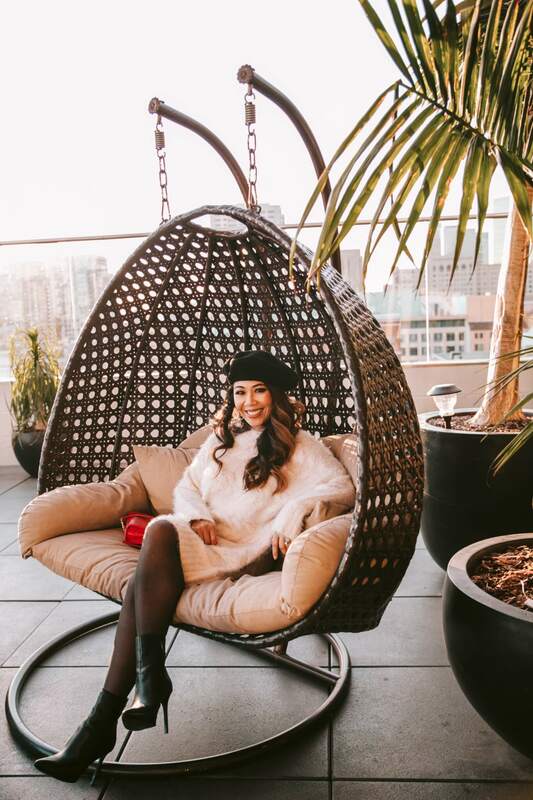 It provided a comfortable and relaxing atmosphere yet allows a great place to unwind and have fun – such as happy hour at the rooftop during the week or at a pool party during the weekend. 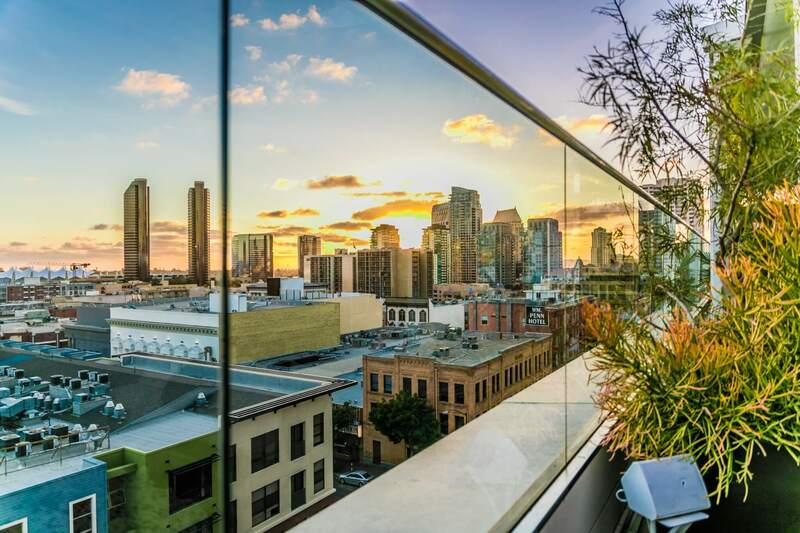 If you are looking to visit San Diego, we highly recommend Andaz San Diego! The hotel is on 600 F Street, San Diego, CA 92101. Book your next vacation online or by calling them at 619-849-1234. Such a beautiful location! My hubby and I fell in love in San Diego, and we are planning a trip back for our 5 year wedding anniversary! I’ll definitely add this hotel to the list of places for us to stay. Your writeup is beautifully done! Hi Shannon! First, thank you for stopping by! Second, The Andaz SD was great; they provide impeccable service! Make sure you have a few days when going there; so much to explore in the city and surrounding areas like La Jolla and Coronado! This is so great! San Diego has always been on my list of places to go, and I’m actually making it happen this year! I’ll definitely look into staying at the Andaz. The hotel is beautiful! Oh girl! You’ll have so much fun (the weather alone is reason to go)! The Andaz is wonderful; customer service is fabulous and so helpful. Such beautiful photographs! Love this post! Definitely need to visit San Diego soon! Hi Carly! The photos were done by the talented Zbella Photography. And yes, visit SD! Hopefully soon for some fun in the sun! Beautiful location and gorgeous pics! I’m with you on the beauty of SD and hotel! The pics are from Zbella Photography. This looks like such an amazing place to go! We are going to have to add this to our list of places to visit. Yes, definitely add to the list! I think you’ll love it! You can click on the hotel name in my post, so you can find out availability and pricing. It looks like a nice place to go on vacation. Hi Tiffany, it’s a great city – so many things to do there! Oh wow! What a fabulous place to stay! And in a super city, too! Hi Gabrielle! Seriously a beautiful hotel right in the city! And that view from rooftop! Hey Calvin! Maybe something to add to your wish list? Awesome photos! I love that area and the red dress is gorgeous! Zbella Photography is who took the photos, and she did a great job! If you’re interested in the dress, I’ll be linking it to my Instagram @predupre later this afternoon! If you’re ever in SD, consider staying at the Andaz! Beautiful hotel! Thanks Doris! Zbella Photography is who I used! Thanks! My photographer did a great job! Totally fab! I’d love to check this out! Yes please do! The link to the hotel is in the post itself (just click on the hotel name), so you can check out dates/rates on there. If you do, let me know about your experience! Would love to hear your thoughts! Thanks! Glad you think so also! What a great trip. I’ve never been to San Diego – thanks for the recommendations! You are absolutely welcome! Happy to recommend it! Great information & pictures. Thanks for sharing! I am happy you find this useful, Nancy! It looks like you had a wonderful time. Great pictures and wonderful scenery pictures that you took. That pizza does look very tasty. Looks like a lovely place to stay. The pizza by the fire looked great. Yes, pizza looks good right about now! 🙂 Great venue and food is good too! Great photos. love them. thanks for sharing. You’re welcome! Zemina did a great job! great photos. love them..Thanks for sharing. Yes, I agree! Zbella Photography did a great job! Definitely has a lot to offer! Yes! Great hotel and location! It’s a perfect venue and location! Great view from the rooftop. Never been to San Diego, will have to put it on the list! Very interesting place to be. I can imagine having a nice breakfast on that rooftop. The food they serve is delicious and the service is great! This looks like a beautiful place to visit and so romantic. I love the rooftop bar! That’s definitely one of my favorites about the hotel! I love that this is fancy but not stuffy! You pretty much summed it up correctly! You’re welcome! Glad you find it helpful! I think you’ll love it there Olivia! These locations and pictures look so peaceful! Love it! The hotel is amazing and Zemina captured the hotel beautifully! Thank you kindly Nancy! 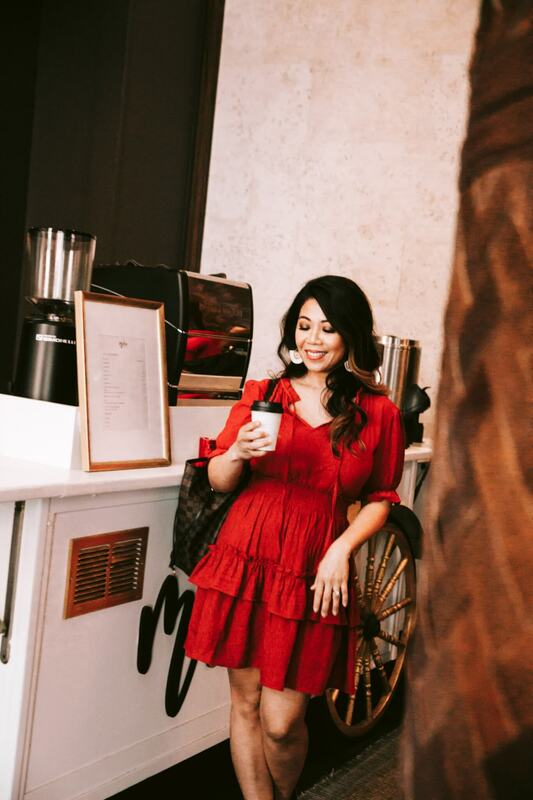 The shots were captured by Zemina, and her photography skills definitely show in these pics! Glad you like the hotel! I love San Diego and this hotel looks amazing! this looks sooo beautiful ! they did a great job with the hotel and the service is so great! It looks gorgeous, I would love to go there!! I think you’ll enjoy the great venue and location! A nyc read it was! I love San Diego I lived there a long time very beautiful there. This looks like so much fun! I’ve never been to San Diego, but have always wanted to go. I especially love the outdoors area with the fire pit. When the sun goes down, it gets a little chilly at night. The fireplace was great to just sit around and be comfortable! I’ve always wanted to go to San Diego!! SO GORGEOUS! If you can believe it, I grew up in the Bay area of CA and this is my second time visiting SD! Hoping you’ll be able to visit soon! I have been in a few of the States but California is not one of them. I live in Canada and this time of year the weather there is mighty enticing. I walked to the library this afternoon, only a few blocks from my house. I was afraid I might have frozen spots on my cheeks! Oh no! Hoping you’re able to escape the cold weather soon! Spring is right around the corner though! Looks like a wonderful place to visit! Thanks for sharing! Totally agree! Right in the middle of everything! Zemina did a great job of capturing the hotel venue! Amazing post and awesome pics. Thanks so much for sharing..
Ok, now I really need to plan a trip! I will be able to visit The Winchester House when I am there. Thanks for the most informative post. California trip will be great! I lived in San Jose, and the Winchester House is there (I’ve never been). 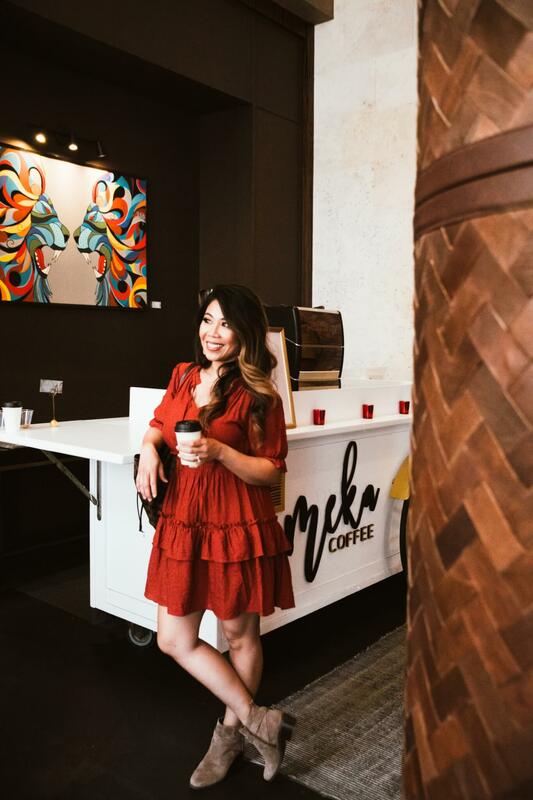 Let me know if you do visit that or the Andaz in San Diego! The hotel you stayed in looked amazing! I never travel but California is definitely on my Bucket List! Hi Tiffany! Hope you are able to get this off your bucket list soon! This is a beautiful hotel with nice amnenities. I enjoy being within walking distance from the places and experiences to enjoy while on a trip. Thanks for a beneficial review. If I get the opportunity to go I will come back to it. You are more than welcome, Christy! Hope you’ll be able to visit soon (the weather alone will be worth it!)! Hope you’re able to go soon! Great venue! Oh yes! Hope you’ll be able to visit them soon! Great customer service and the rooftop views are magnificient!